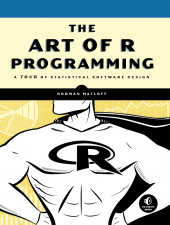 It’s difficult to write a book on an entire programming language and keep it manageable and concise, but The Art of R Programming does it as well as any text I’ve seen. Matloff covers, in detail and among other things, R data structures, programming idioms, performance enhancements, interfaces with other languages, debugging and graphing. There is the requisite “Introduction to R” section that is present in almost all R texts, but any beginners who benefit from this chapter may benefit from re-reading ARP after some additional practical experience with R. The issues that Matloff addresses and the solutions he provides are more salient after you’ve spent hours trying to resolve them. The section on graphing is a good overview, but the average programmer may find it less useful than the other sections. Anyone looking for graphic optimization tips will be better served by a book focused specifically on graphing. With that minor critique in mind, put simply, The Art of R Programming is a must read for all intermediate level R programmers. It covers nearly every method of performance enhancement available and provides a review of key fundamentals that may have been forgotten or missed. One point of note, this text focuses almost solely on programming – the statistical examples are a means to an end, not an end themselves. For that reason, this book is recommended for those seeking to improve the efficiency of their programming rather than their statistical acumen.